Championship strugglers Aston Villa have named ex-Birmingham City player and coach Steve Bruce as their new manager just over a week after Roberto Di Matteo was given the elbow at Villa Park. The 55-year-old Bruce left Hull City in the summer after taking them back to the Premier League. Indeed, the former Manchester United defender has returned four sides to the top-flight in his managerial career, more than anyone else. 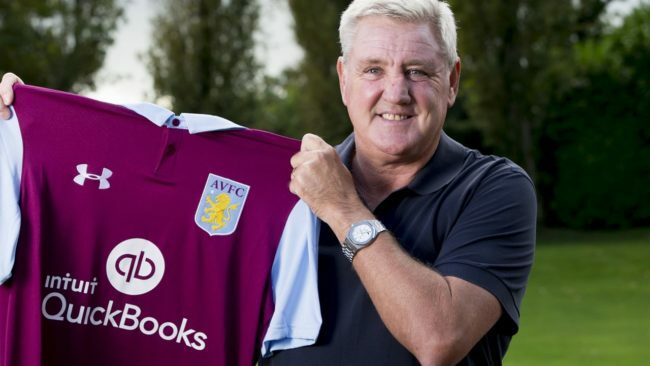 Bruce was in the frame for the England job, only to be beaten to the post by one-game wonder Sam Allardyce and will be eager to make his mark with the Villans, who ignored his past with bitter rivals Birmingham. Author of a trilogy of ropey novels, Bruce faces a massive task with the Blues’ rivals, who currently lie 19th in the Championship, just two points above the drop-zone. However, the Corbridge-born coach has a wealth of experience under his belt, having managed the likes of Sheffield United, Wigan and Sunderland. It is one of the big clubs of this country. To be given the opportunity to manage it is terrific. I relish the challenge of trying to take the club where it wants to go and needs to be – and try to turn around the misfortune we seem to have had over the past few years. Bruce will be the sixth different manager to oversee a Villa game in the past 12 months and faces a tricky first fixture, against local rivals Wolves. However, a proven coach and a likable one at that, he may well be the one to kickstart one of the great clubs of English football. “giants”-?!??!? HAHA!! Have you been drinking? What next, Liverpool are a “big club” because they were good 30 years ago?… Villa are mickey mouse. They’ll be in League One this time next year (even though doctor tony thinks they are bigger than Barcelona). So that one of the championship relaxation places filled then.